State Herbarium Hon. Research Associate Bob Baldock reports on the following two images. 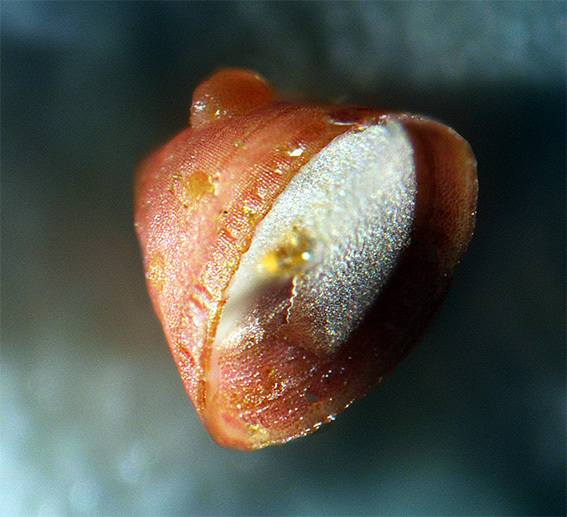 They depict not a sea shell, or a coral, but a red coralline alga — no more than 2 mm tall! It was found scattered on the fine branches of a brown alga, Cystophora (2.6MB Algae Revealed fact-sheet) from 20 m deep at Pearson Island, off Ceduna, by the Marine Park Monitoring Group in March 2015. Finding a name for it is proving difficult. It doesn’t fit exactly into diagnostic features of known species. The closest match that has been suggested is Hydrolithon farinosum (link to species entry in the online version of H.B.S. 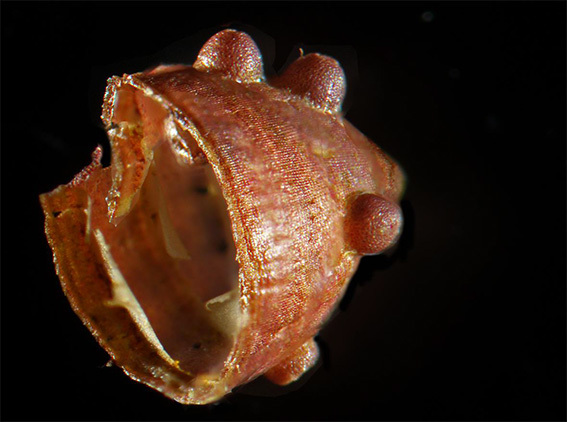 Womersley‘s Marine benthic flora of southern Australia). It is “pixie hat” shaped and one cell thick with several flimsy diaphragms stretching across the hollow inside (torn in the picture below, but still visible). The external pimply knobs house spore sacs each holding a pair of relatively large spores. This entry was posted in The Plant Press on 28 May, 2015 by Jürgen.